Dragonkey is a great villa for families who want to stay in a modern, chic villa that has top-notch technology. It has a great location near Magen’s Bay and the golf course, plus great views of the island and the sea. Stunning views of the Atlantic Ocean and Hans Lollick! Dragonkey sits perched atop a ridge in Mahogany Run, an exclusive gated community on the northern coast of St. Thomas. 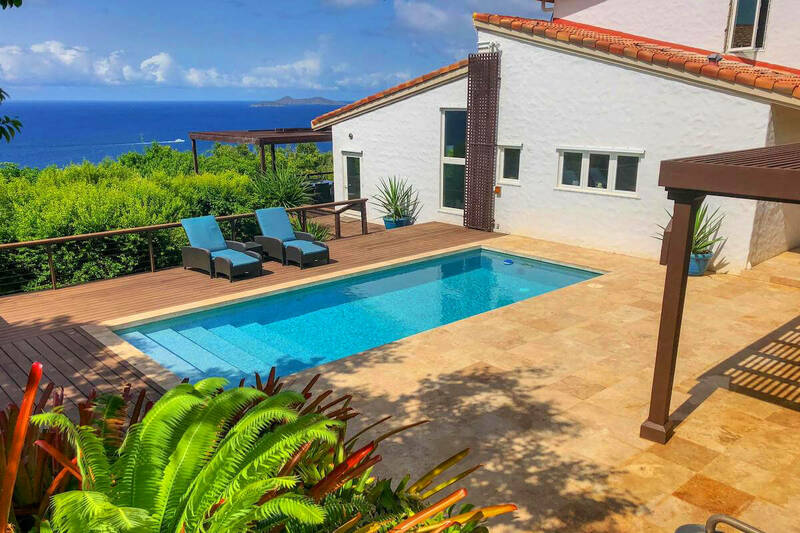 This family-friendly villa enjoys stunning views of neighboring islands and the sea. The turquoise pool is surrounded by a wooden patio and stone deck with various lounging and dining spots. Adults can relax in the hot tub while kids run around the playground. Tall, tropical trees provide shade and the veranda shades more lounging. The patio wraps around the villa, with another dining table around the corner. Dragonkey offers guests private parking. The main house has chic decor and is comprised of two levels. The main area is comprised of the foyer, office, kitchen, and half-bath. Watch movies on the massive flatscreen TV from the sectional in the comfortably furnished living area. There’s a dining area a few steps above. The gourmet kitchen has ample counter space for food prep and is equipped with stainless steel appliances, a 6-burner stove, double oven, and a large refrigerator. The office sits just off the foyer and has a small library, computer, and a desk. The master bedroom on the ground floor has a king bed, an ensuite bathroom, and a large closet. On the upper floor there are two bedrooms, one with a king bed, the other with a queen. The office also contains a twin bed. Beneath the main house, there’s a private suite furnished with a king bed, full ensuite bathroom, and a private patio with incredible views of the ocean and adjacent islands. This suite can be accessed from the main patio. Dragonkey is near Mahogany Run Golf Course, Magens Bay, and several restaurants. The Magen’s Bay Trailhead is also a short drive away for guests who want to hike and explore the island by foot. Rates do not include: tax of 12.5%, island charges of $350. Approximately a 9 minutes car ride to Magens Bay Beach.